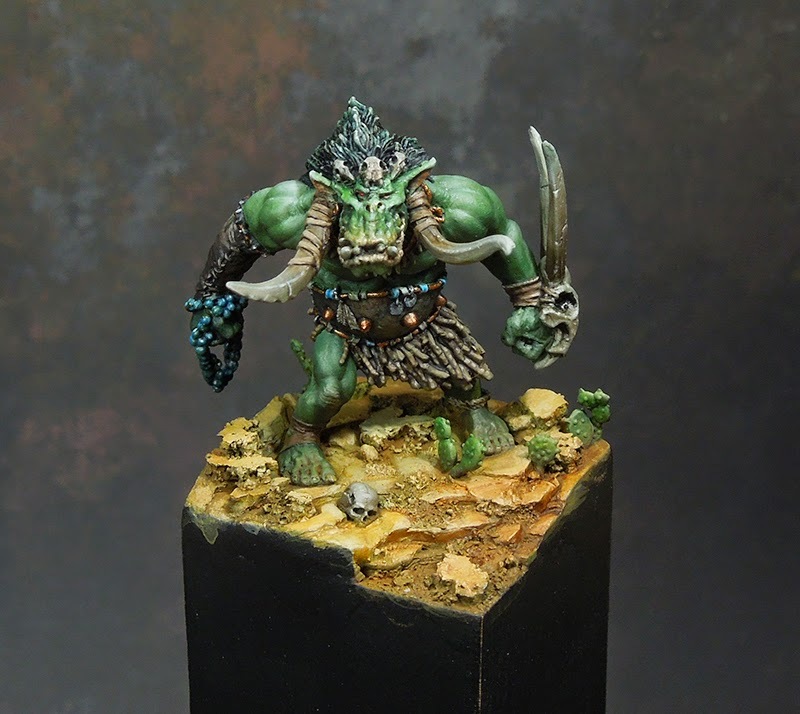 another tutorial voting went by and the winner this time was "Orc". Finally the curse which lay on this article is broken and it is to be revealed. 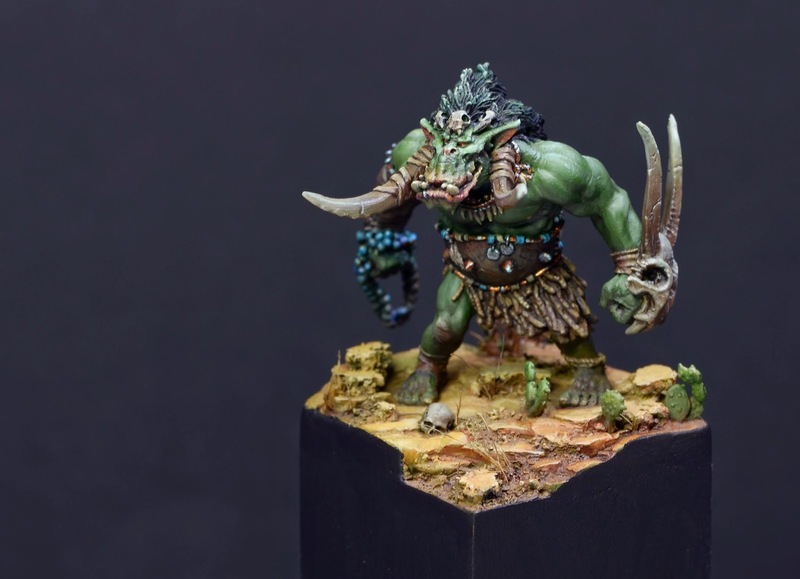 The model itself is out of the succesful Kickstarter "Drakerys, the miniature game", run by the jungle friends "Don't panic games". 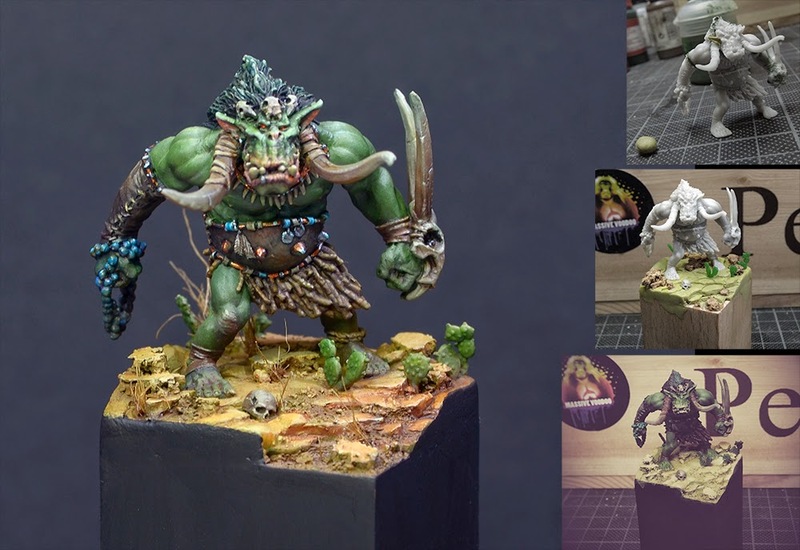 Beautiful models they will bring and as we heard a great game system too. 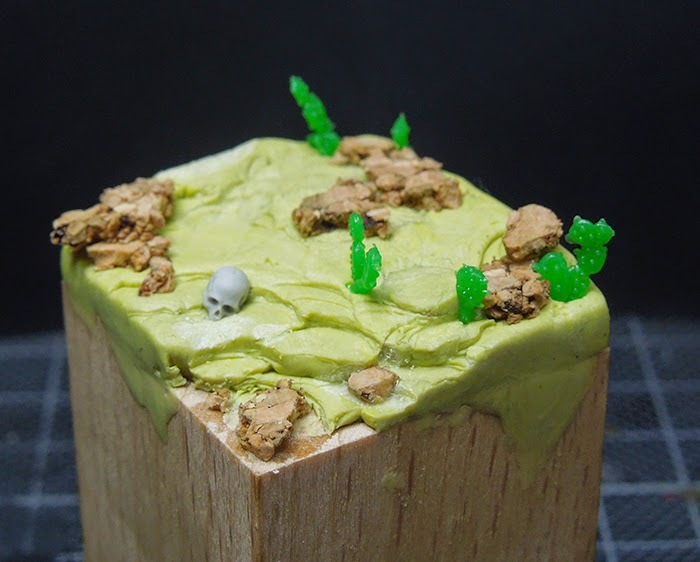 Planning a simple but yet cool base for this guy I went for the groundwork with layers of Milliput that I stamped with - let me remember, ah yes, the back of my fingernail - some thin cork, a skull by Origin-Art and some plastic cacti by Pegasus Hobbies on top of a wooden squared plinth. Some tiny stone rubble was placed after the Millput was dry. 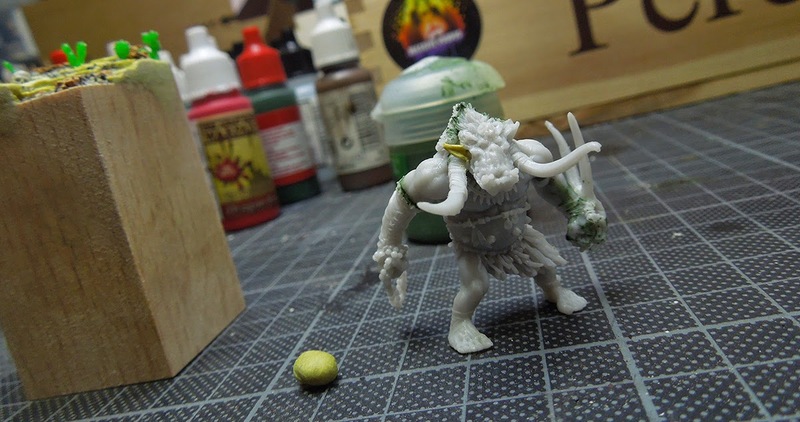 Unfortanetly I had to resculpt an ear of the Orc as this was just missing on my cast. Check the Miniatures Unpacked of this model here. I used Milliput that was left from my basework and did so by creating the rough volume for the ear, placed it to the model and then used a toothpick to form it. After the ear was dried I placed the model on top of its base and sanded the edges of the wooden plinth. 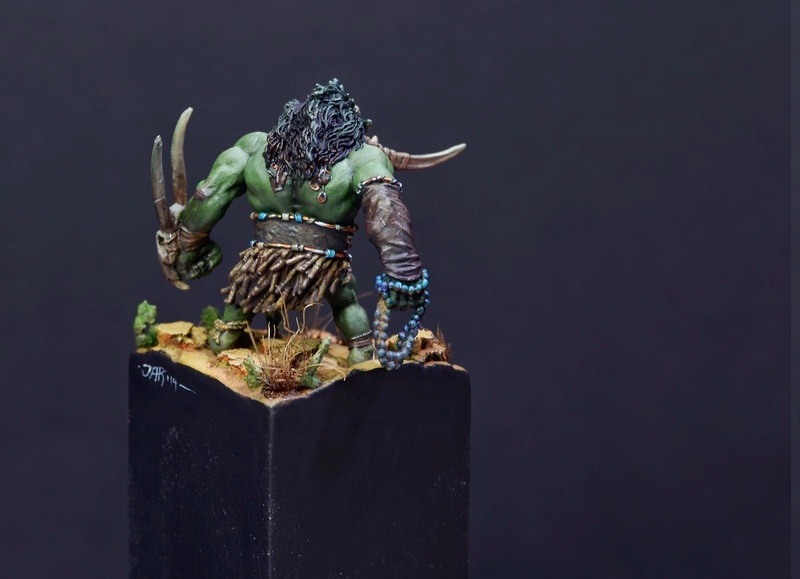 If bases don't go too big I do enjoy working model and base at once to have a better overview on the whole "canvas" I am painting on. This is personal taste and like I said, sometimes - depending on your basework - it does not make sense at all. 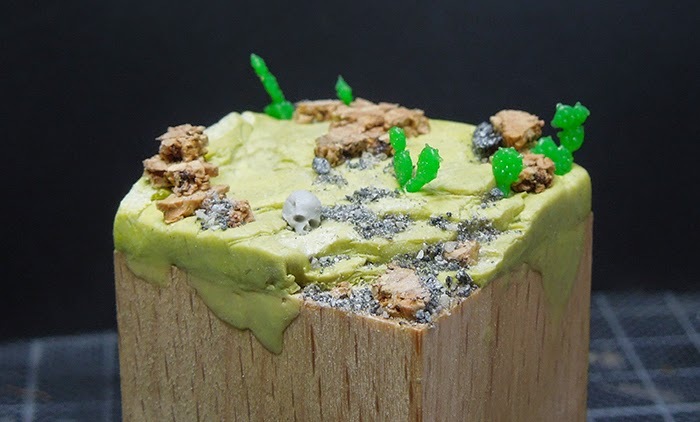 Quickly I realized that I wanted more highlights on top of that and mixed in some VMC Ice Yellow into the base mix, sprayed it on top of the model and took a drop of yellow to change this mix even more - sprayed that to the groundword where I have planned a desert area later on. 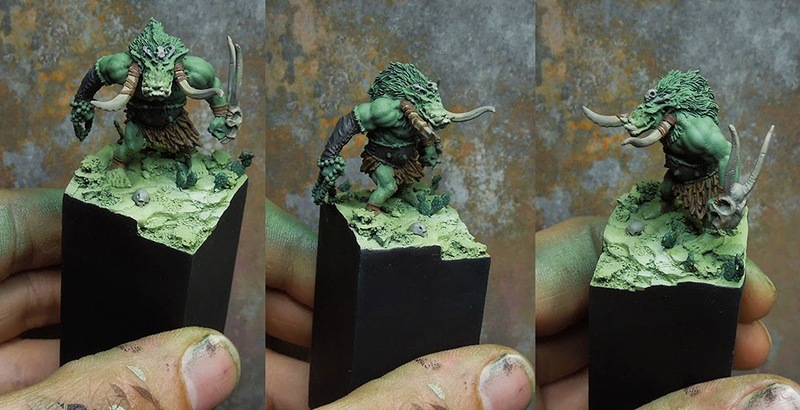 Now I went for some browns and desaturated sand tones to give the leather parts and the bone parts their basis for later work.This also helps me to get a better visual grip of the model itself. 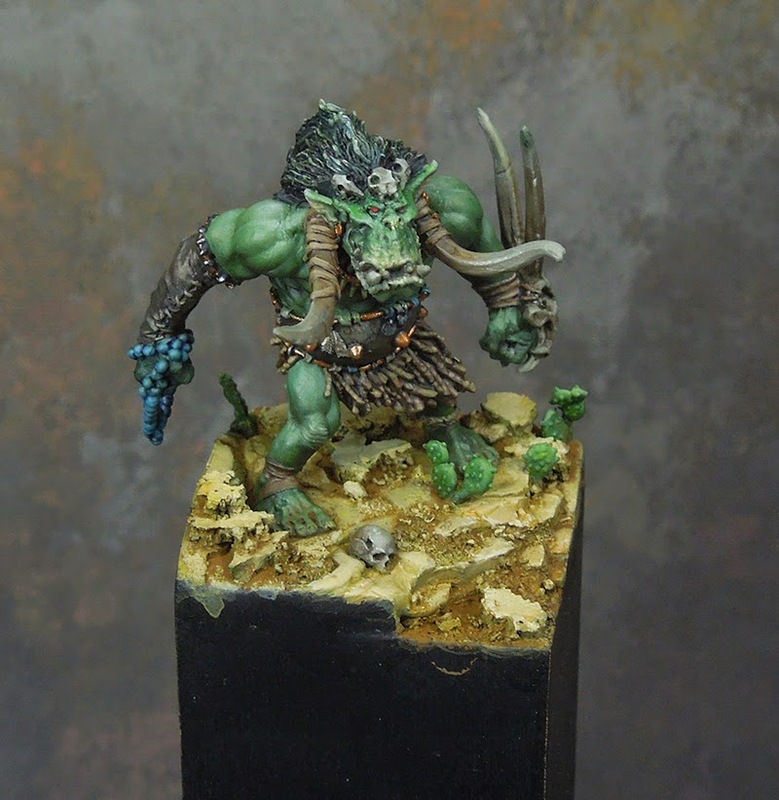 Next step was using some yellowish sand tones to the base, work on some highlights on the leather, bones and hair. Metal parts and hair have been painted black. The hair recieved a line of blueish grey in it to later on present a coloured part of the hair. The same blue but with less grey in it was used for the perl necklace and some fabric parts on his belt. Repeating such colours help to bring the model together. Now for intensifying the colours. I took some yellowish glazes to make that sand tone stronger and mixed in some VMC Ice Yellow to paint some stronger highlights to the base. 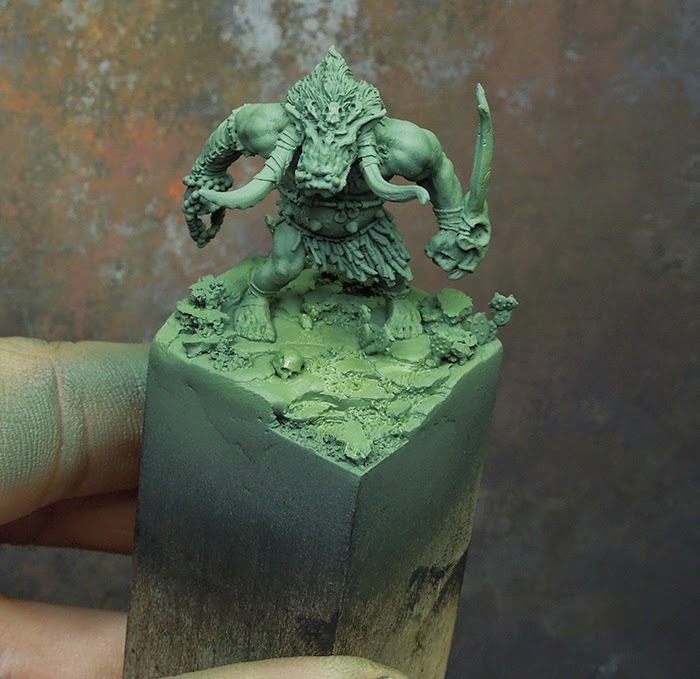 Green glazes were used to make the skintone more intense. Now it was time to start with detail work. Now all the small details, like Edge highlights on every material were worked on.They eyes recieved some red. 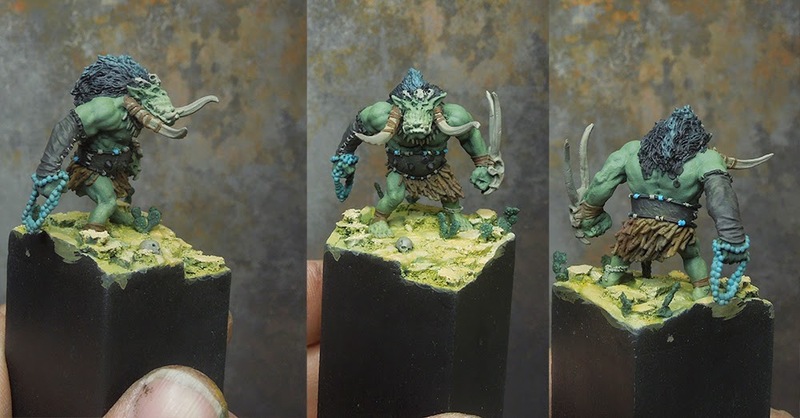 Bone parts recieved some brighter highlights and with the same colour the small fixation stripes on his right arm pad were painted. The cacti recieved some layers of stronger and more saturated green. 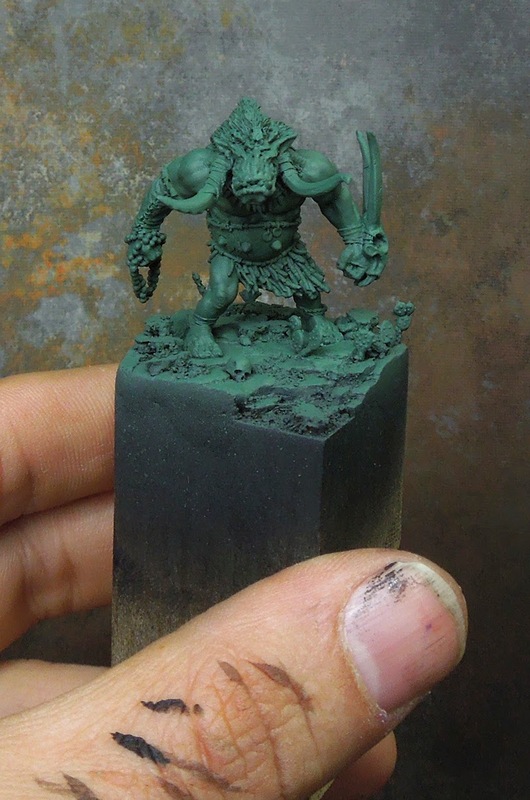 Brownish pigments have been placed on the base and metal parts have been painted in GW's old Dwarf Bronze and Scale75's Black Metal as basetones. Army Painters' Strong Tone was used to darken the bone, leather and skirt parts. Now I went for increasing the contrast even more. 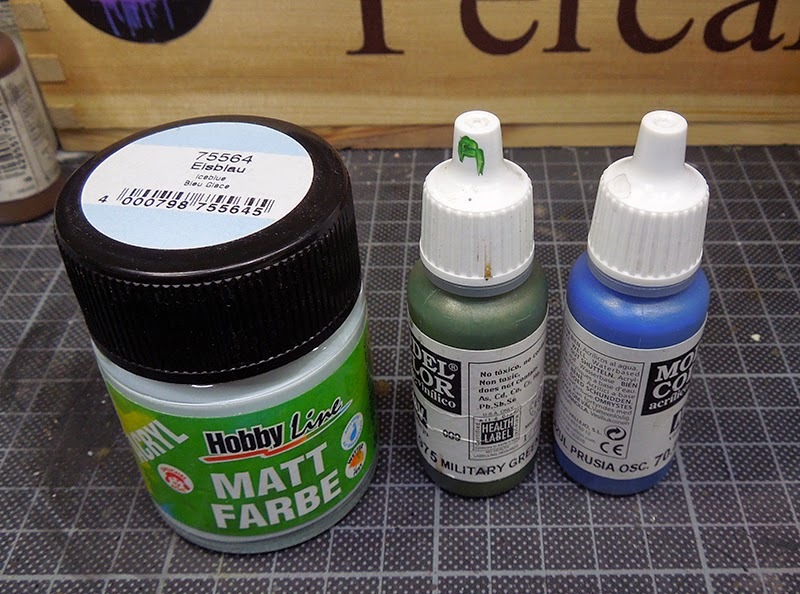 Greens have been highlighted with mixing a small drop of Ivory into the last mix. 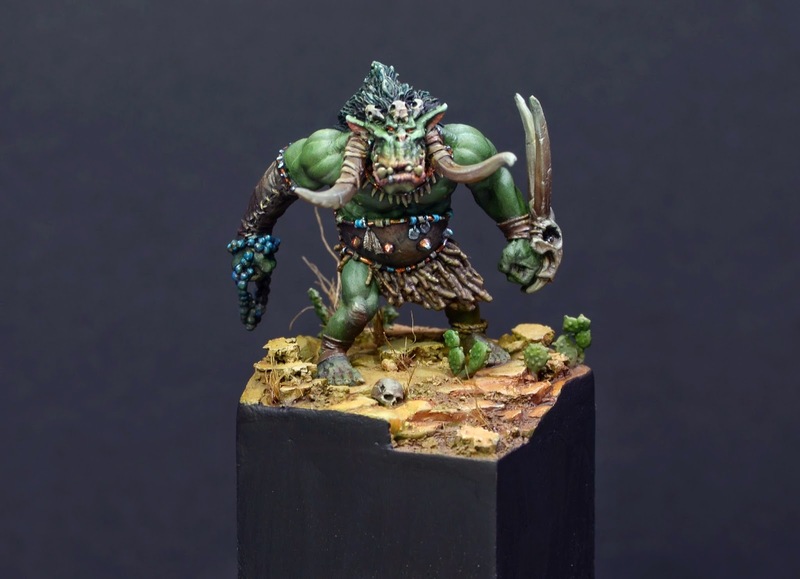 Did the same with the hair- and bonecolour. In the other direction I went with further glazes of Army Painters' Strong Tone. For the skin's shadow I used thin glazes of my initial basic tone first to find my way in the shadows, slowly increasing the contrast with these shadow glazes by adding a tiny drop of black to it. The base recieved some dark orange brown glazes to the front stone areas, but only to its side, not on top to bring in a more interesting colour varation of the desert area. The face got some more attention and I tried to paint all the small volumes that make the face. I used some pink skintone glazes for the lips, nose and ears and also some yellow + green to get a better connection from the lip to the face skintone. 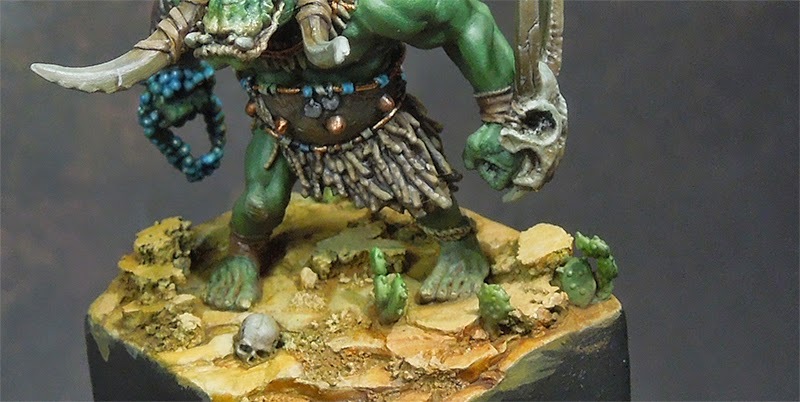 I added some more water thinned pigment glazes to his feet to make the pigments not covering the whole feet, but let them gently run between his toes. Now it was time to take a look from further away on what I have worked on so far. I was happy so far, but not done yet. 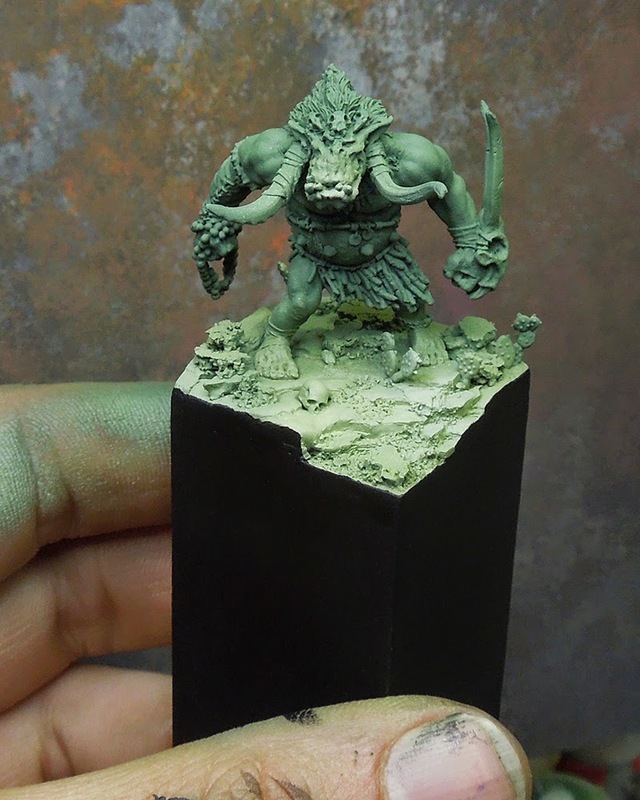 For a quicker project I'd say fine, but I wanted to get out a little more of that Orc. 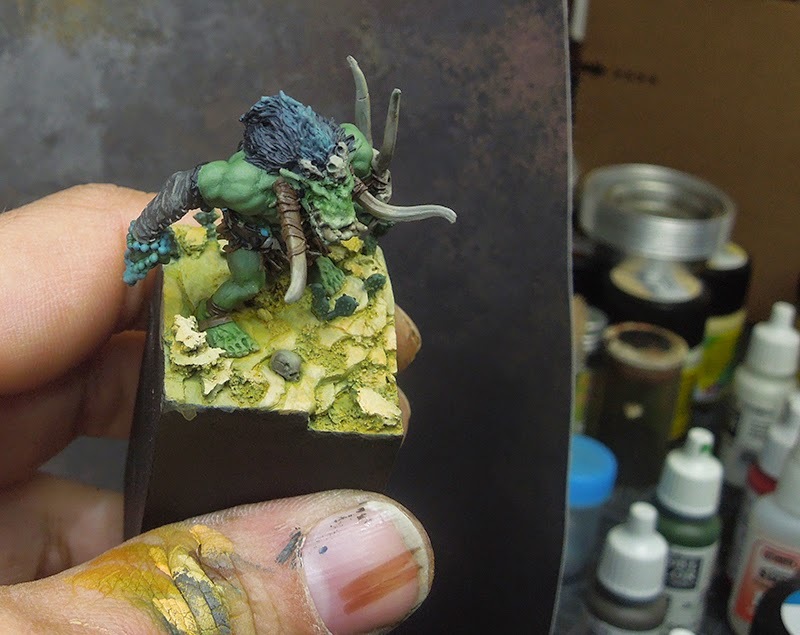 - Increasing the contrast in the green skin by work on smaller areas on top of the so far done small areas. This step helps to bring out each volume and its light situation. It takes time but it is rewarding. Tip: If you think your highlight went too strong. glaze it with a bright green tone to bring it all together again. Now you can carefully work on the lights again. Wax on, wax off! - Working on the colour intensity of the facial area. I enjoyed those skintones and yellow tones in the mouth area and increased their intensity. 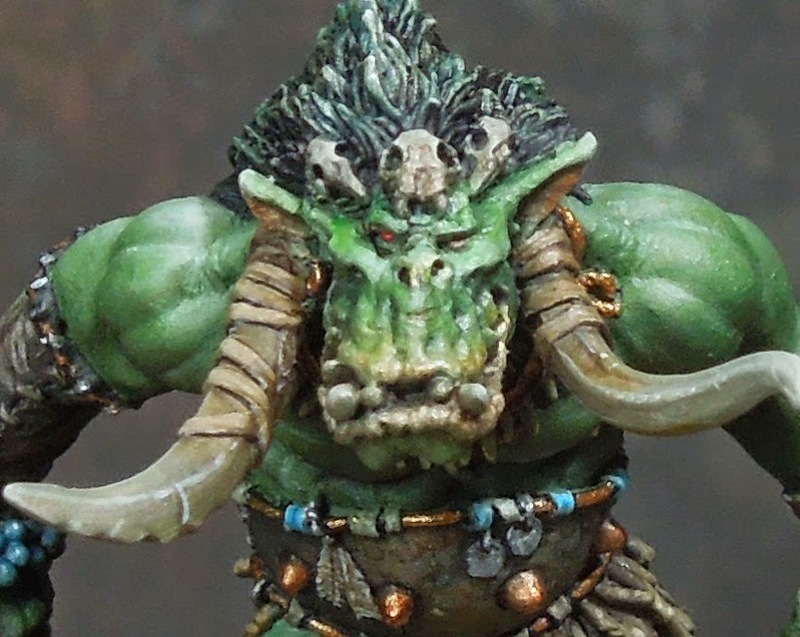 Tip: Same here, due colourful glazes you might lose the intensity of your highlights. Redo them but this time do them in the colour that has appeared at this particular point. 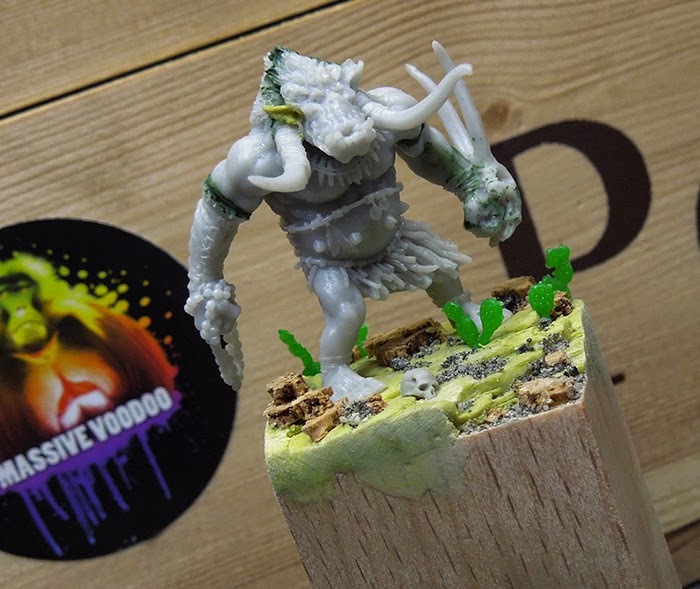 For exampe in the mouth I added VMC Ivory to a mix from green, humanskintoe and purple to find the natural looking highlight colour there. - Checked back with my shadow areas. If you find a shadow not dark enough, do not hesitate to still put some time in it. Tip: Only work in your shadow areas, not in your basetone or highlight areas, you might destroy all you have done so far by mistake. - Worked on edge higlights in the metal parts and added some rust and verdigris by Modelmates to it. 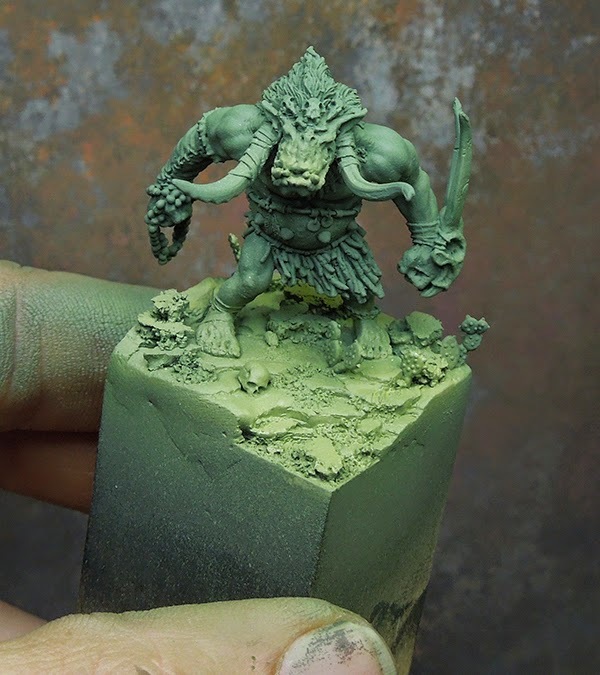 Tip: If your metal parts are really tiny, like on this model you can keep them simple as too much work on them is another part that might distract the eye from the really important areas of a model. Hey Peter, indeed I think colour recipes are one thing, but as you say, the way of progress is also important. 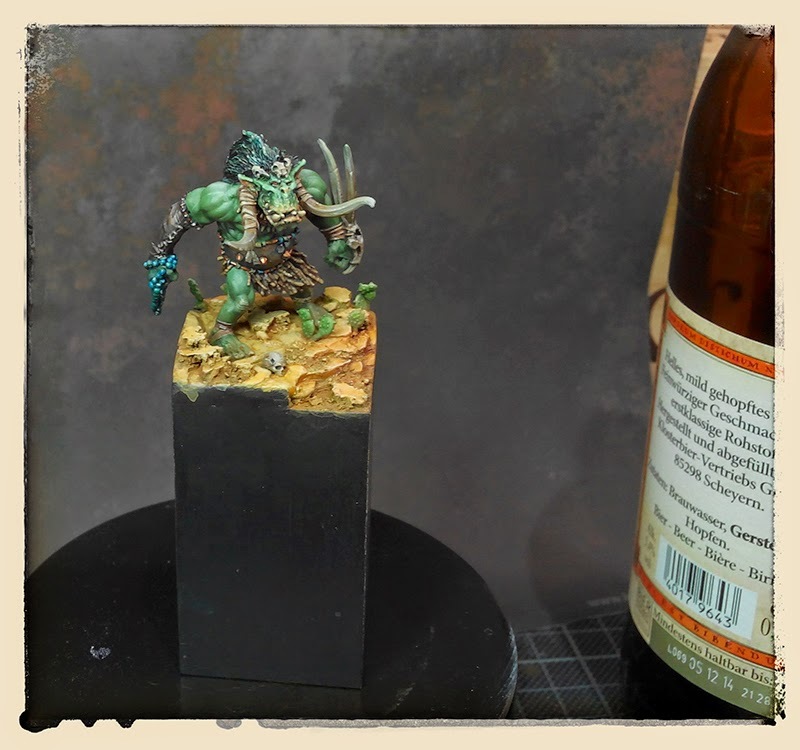 I really have a hard time trying to talk about colour recipes in such an article as I sometimes feel myself doing free painting instead of technical applyment of different colours. I often don't care about the colours, I use what tone I am in need of, don't think about the name, brand or such ... just paint with it. 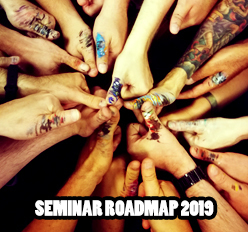 Thanks for the feedback to the article, happy that you enjoyed it!